Abstract. This study explores the interdecadal variability and trends of surface horizontal visibility at the urban area of Athens from 1931 to 2013, using the historical archives of the National Observatory of Athens (NOA). 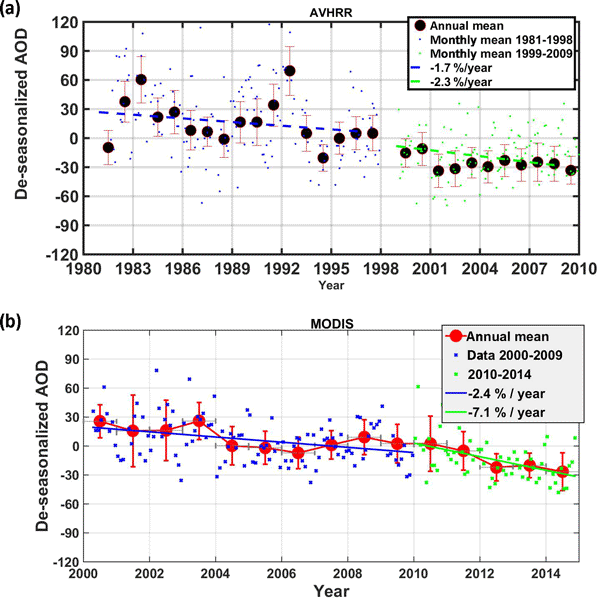 A prominent deterioration of visibility in the city was detected, with the long-term linear trend amounting to −2.8kmdecade−1 (p < 0.001), over the entire study period. This was not accompanied by any significant trend in relative humidity or precipitation over the same period. A slight recovery of visibility levels seems to be established in the recent decade (2004–2013). It was found that very good visibility (> 20km) occurred at a frequency of 34% before the 1950s, while this percentage drops to just 2% during the decade 2004–2013. The rapid impairment of the visual air quality in Athens around the 1950s points to the increased levels of air pollution on a local and/or regional scale, related to high urbanization rates and/or increased anthropogenic emissions on a global scale at that period. Visibility was found to be negatively/positively correlated with relative humidity/wind speed, the correlation being statistically valid at certain periods. Wind regime and mainly wind direction and corresponding air mass origin were found to highly control visibility levels in Athens. The comparison of visibility variation in Athens and at a non-urban reference site on Crete island revealed similar negative trends over the common period of observations. This suggests that apart local sources, visibility in Athens is highly determined by aerosol load of regional origin. AVHRR and MODIS satellite-derived aerosol optical depth (AOD) retrievals over Athens and surface measurements of PM10 confirmed the relation of visibility to aerosol load. 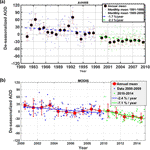 How to cite: Founda, D., Kazadzis, S., Mihalopoulos, N., Gerasopoulos, E., Lianou, M., and Raptis, P. I.: Long-term visibility variation in Athens (1931–2013): a proxy for local and regional atmospheric aerosol loads, Atmos. Chem. Phys., 16, 11219-11236, https://doi.org/10.5194/acp-16-11219-2016, 2016.